A wave of commemoration for the birthday of late SHINee vocalist Jonghyun filled social media on Sunday. Jonghyun’s agency S.M. Entertainment also took part in remembering the K-pop star by sharing a photo of him on SHINee’s official Instagram and Facebook account. 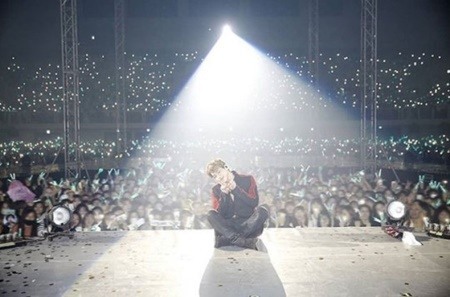 The photo showed Jonghyun happily posing onstage with fans behind him, with hashtags #SHINee #JONGHYUN #19900408.” A flood of commemoration followed, with fans leaving comments such as “happy birthday Jonghyun” and “I miss you.” The photo was shared more than 10,000 times within 10 hours after it was uploaded. Jonghyun was found in a state of cardiac arrest at a rented studio apartment in southern Seoul in December last year. He was rushed to a hospital but was pronounced dead. His posthumous album “Poet | Artist,” which was completed last year, was released in January.